Hand made in Europe, the stylish Vivid Decanter has a wide base for ideal aeration of your wine. Lightweight, lead-free crystal makes it the perfect decanter for wine that is both easy to hold and pour. Aerates wine faster with a wide base. Hand made in Europe, the stylish Vivid Decanter has a wide base for ideal aeration of your wine. Lightweight, lead-free crystal makes it the perfect decanter for wine that is both easy to hold and pour. We recommend that you hand wash your crystal wine decanters to retain their original beauty. Size: 10" H, 47 oz. Can this item be monogrammed? BEST ANSWER: The Vivid Wine Decanter is available as a monogrammed item also. Please feel free to reach our consultants at 800-356-8466 and they can assist further. If I already have the Vinturi aerator, will the aerator fit into the decanter opening? BEST ANSWER: You would need to hold over it - it will not work if inserted into the decanter. How wide is the opening of the decanter? I want to add a stopper to this and I want to make sure what size I need to order. BEST ANSWER: This is a lovely decanter; if you'll look on the site (here's the link just in case something gets lost in translation: http://www.wineenthusiast.com/decanters-aerators/decanter-stoppers.asp?tid=3701&icid=TNVDCNTRSRTRSDCNTRSTPPRS), there are 2 beautiful round stoppers which were made to fit this decanter; one is glass and one is cork. Thank you for your question, the opening on the Vivid Wine Decanter is 2 3/4" in diameter. Does this have a rounded or cut glass edge on top? BEST ANSWER: I own the decanter. It Is not rounded at the opening, just a straight sharp cut. That’s a drawback of the design inasmuch as it takes away from the quality of the decanter. It has a cut glass edge. How wide is the decanter at the base (widest point)? BEST ANSWER: Thank you for your inquiry. At its widest point, the Vivid decanter is 10". If you have any further questions, please feel free to reach out to us at 800 356 8466. Thank you again. 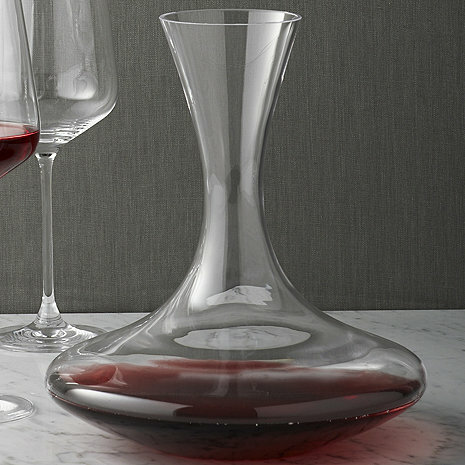 The Vivid Wine Decanter is 10" wide at its widest point. Does an excellent job, with maximum surface area in decanter. Can hold a 1.5L bottle of wine! Great decanter with a wide base but watch out for the last of the wine as it comes out with a rush from the bottom. I use it to aerate and serve wine. Makes a lousy door stop. I do not recommend throwing it at anyone. I like this decanter because a bottle of wine fills it to its widest point, thus maximizing the surface area. On big reds, I fill it through an aerator (which is very easy to do given the large mouth) and the wines open up very well. The only reason this doesn't get a fifth star is that it becomes somewhat difficult to pour the last of the wine out. The shape requires a near total inversion which can be cumbersome. Other than that, it works great and looks great. Notice in all the wine demonstrations you'll see the wine expert pour into a decanter to allow wine to breathe, and yes to serve this way is so pretty on the table! Watch when your pour, it's a little tricky at the end, but is just a classy piece to add to your service. Vivid Wine Decanter, a fantastic value. I have found that every wine seems to benefit from the aeration available with decanting. From the least expensive to the most they all just taste better. The wine decanter I purchased was very elegant. It was bought as a gift, and due to its high quality, I was happy to give it as a present. I would “definitely” recommend this product to everyone! Thank you Wine Enthusiast Company! Decanter arrived just like picture!! Great value for the price and looks like it is worth more. We use the product for entertaining and it's very elegant and simple in design. Goes with any decor. A very difficult decanter to use. You haave to turn it compleatly upside down to get the all the wine out of the decanter. Great product - especially for decanting wines that need a little extra contact with air to open and eliminate tannins. Highly recommended and attractive! I love this product! It's beautiful and does an amazing number on red wines!! Works very well for letting my bold reds open up. And the price was very reasonable. This decanter is functionality and good looks at a good price. this decanters mouth was too big for the stopper i bought from this website ...it went down too far and we could barely get it out. An Overall great product for serving wine. Purchased this as a gift for my father. Was worried that it might be very thin since I was buying it sight unseen and it was relatively inexpensive, but it was nice and substantial. [...] My dad was pleased with it, it was exactly what he was looking for. Overall good experience. You can basically use anything from an old flower-vase to a lemonade pitcher to decant wine. But this decanter is especially useful because of its wide base. Only down side is the occasional drip that runs down the outside of the decanter after pouring. Looks good and very easy to use. Always good to have two or more on hand. Does the job, but looks and feels bulky. The previous, delicate decanter did not survive for long: cracked during storage. Replaced by this. Very pleased with it. Beautiful, large and sturdy. This is a very good product. Can't find anything bad to say. Beautiful product for the price! The decanter looks fantastic on any table and has a very smooth pour. I recommend it to everyone! Very NIce . . . At a very good price! Overall, just a very nice decanter! Good quality at a very good price! It came so quickly and without any fuss. We gave this to our new son-in-law's parents. They loved it so I guess its working good! Very beautiful! And functional too! It was so beautiful. And the price was great. It was just what I was looking for. The Decanter was purchased as a gift for my daughter-in-law. When she received it, she called to inform me as how beautiful it was and how pleased she was with the Decanter, the brush, the drying stand and the wooden cord. She sounded so happy and from the sound of her voice and words, I would highly recommend these items to anyone wanting such a purchase. Thanks for your prompt attention to this order. This is, really, as much as you need. No need for fancy "chemistry lab" alambiques. This one is good enough ! Beautiful piece that provides ideal aeration for wine! I love both!! Going to order glasses for a friend!! Beautiful quality!